Beautifully engraved unissued stock certificate from iBeam Broadcasting issued in 2001. This historic document was printed by the Security-Columbian Banknote Company and has an ornate border on the left side and part of the upper-right side. It also displays the Company's trademark of a large "i" acting as a satellite as it gives off frequency waves in between the letters of "beam." This item has the printed signatures of the Company�s Chief Executive Officer, Peter Desnoes and Secretary, D. M. Fiska; and is over 10 years old. iBEAM Broadcasting Corporation, (NASDAQ: IBEM) offered streaming media distribution, revenue�producing applications and interactive Webcasting services to major entertainment and enterprise customers. iBEAM led the streaming industry from 1998 through 2001. iBEAM's On�Target ad insertion technology and Activecast interactive Webcasting capabilities created value for companies who used streaming media. By January 2001, iBEAM was delivering 100 million streams per month across its network of high-performance servers located in more than 210 networks around the world, connected by satellite, and augmented with fiber optic cable. At that time, iBEAM's customer list included more than 460 companies, including media and entertainment leaders Disney, Paramount, MTVi, Sony Music Entertainment, IBM/Lotus, Bristol-Myers Squibb, Merrill Lynch and LAUNCH.com. iBEAM's technologies were founded in 1998 by Navin Chaddha and Nils Lahr while the business was incubated by CrossPoint Ventures. As the first global streaming media network in existence, iBEAM was a pioneer and key inventor in dozens of new technologies. Second to none, Akamai offered to purchase iBEAM for 2 billion dollars in early 2000 and the board declined the offer. iBEAM had a successful IP on May 23, 2000, offering 11,000,000 shares of common stock at an offering price of $10 per share. However due to the "bubble" bursting in late 2000, most of iBEAM's tier one customers pulled out of the streaming market. During 2000, iBEAM acquired five companies worth a total of 500 million, had offices in Hong Kong, London, New York, Los Angeles, Oklahoma City and Sunnyvale. The company's employee count was approximately 1,400. 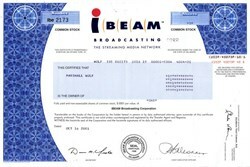 In mid 2001, Williams Communications purchased iBEAM. iBEAM Broadcasting� Corporation, (NASDAQ: IBEM) offers streaming media distribution, revenue�producing applications and interactive Webcasting services to major entertainment and enterprise customers. iBEAM is leading the future of streaming media through its focus on customer care and improving its customers' businesses. iBEAM's On�Target� ad insertion technology and Activecast� interactive Webcasting capabilities create value for companies who use streaming media. iBEAM currently delivers nearly 60 million streams per month across its network of high-performance servers located in more than 160 networks around the world, connected by satellite, and augmented with fiber optic cable. More than 400 innovative companies use iBEAM, including media and entertainment leaders Sony Music Entertainment, and LAUNCH.com. iBEAM was founded in 1998. For more information about iBEAM's services, visit www.ibeam.com, or contact the company at 645 Almanor, Suite 100, Sunnyvale, CA 94085, telephone 408-523-1600.